The Aspen Lodge furniture are environmentally friendly, all logs are harvested from dead-standing aspen trees. The aspen logs used to make the rustic dining log dining chair is hand peeled so as much of the natural beauty and character of the logs are left as much as possible. Aspen Lodge furniture only uses the most unique logs to ensure your one of kind look, no cookie-cutter style here. 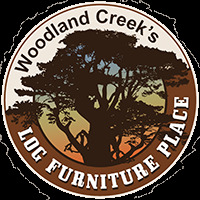 They build each piece of log furniture with the unmatched signature look and rugged, long lasting strength which is something that cannot be duplicated in mass production. Due to the unique logs, log sizes may vary. A Clear semi-gloss lacquer is applied to bring out the natural beauty of the wood.